Suzanne M. Schadl is curator of Latin American collections at the University of New Mexico, where she teaches Latin American Studies and serves as Subject Librarian to American studies, Chicano studies, History, Latin American studies, Spanish and Portuguese. She is also the Rapporteur General for the Seminar on the Acquisition of Latin American Library Materials (SALALM), Member at Large for the Latin American Microfilms Project (LAMP) and Editor of the Resources for College Libraries' Spanish and Portuguese Literatures list. Prior to her job at UNM, Suzanne was an assistant professor of history at Roanoke College and a visiting instructor of Latin American History at the University of Texas in Austin. She also served four years as Director of the Gerald and Betty Ford Library at the Bosque School in Albuquerque. 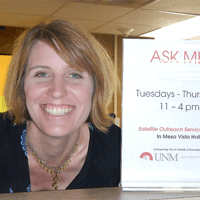 Suzanne feels truly blessed to work as a librarian at UNM, which is among the best collections and most vibrant communities for the study of Latin America and the Hispanic Southwest.